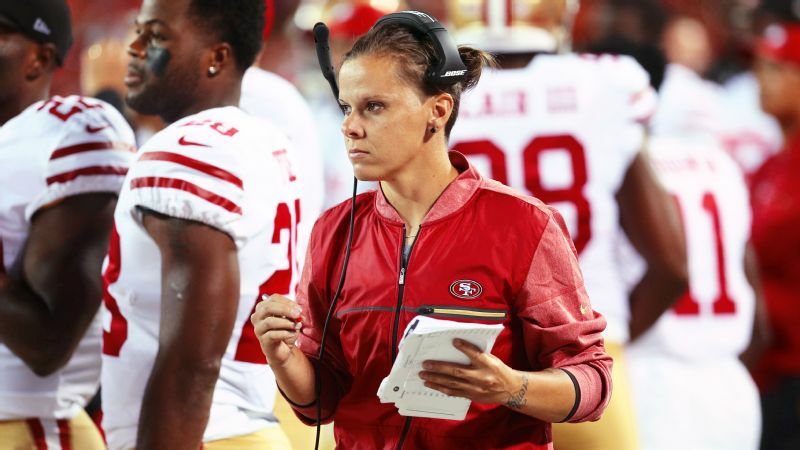 Katie Sowers is the second woman in NFL history to have a season-long coaching job. 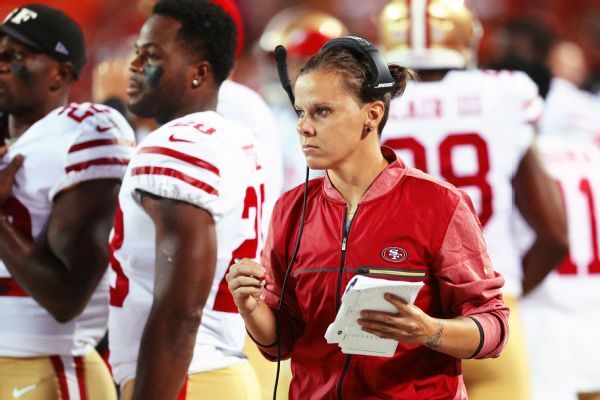 The San Francisco 49ers hired Katie Sowers as an assistant coach for the 2017 season, making her the second woman in history to hold a full-time NFL coaching position. 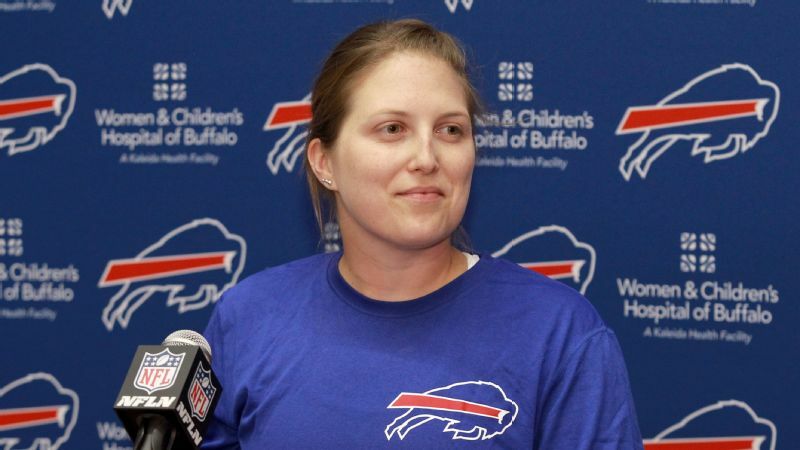 (The first was Kathryn Smith with the Buffalo Bills in 2016.) On Tuesday, Sowers, 31, also became the NFL's first openly gay coach. Sowers played quarterback for the Kansas City Titans in the Women's Football Alliance, a professional tackle football league, and has competed for the U.S. in the IFAF Women's World Championship. She's also served as general manager of the Kansas City Titans. Sowers was an intern with the Atlanta Falcons in 2016, when Shanahan was the team's offensive coordinator. Shanahan brought Sowers to San Francisco as part of the Bill Walsh NFL Coaching Diversity Fellowship. "We plan on her assisting with the receivers," Shanahan said. "Katie did a real good job for us in Atlanta, she's done a really good job here. 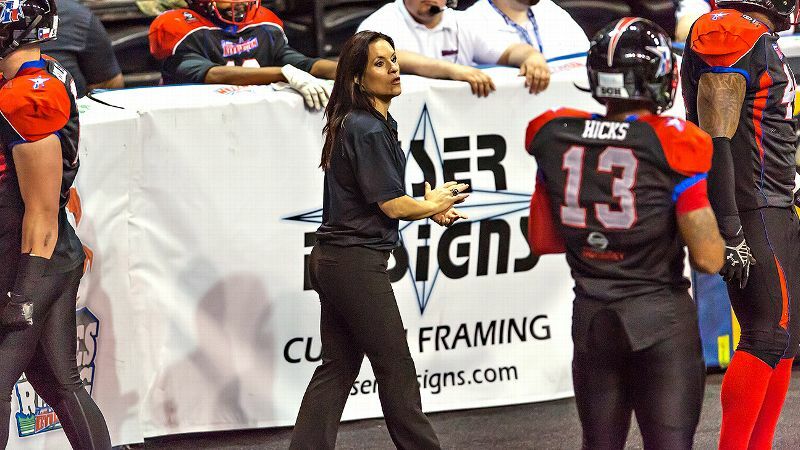 She helps [receivers coach] Mike LaFleur out, just with some rotations and she helps our quality control [coaches] out just with all the stuff they have to do. "She's a hard worker, you don't even notice her because she just goes to work and does what's asked. Because of that, she's someone we'd like to keep around. We're still figuring out exact titles and stuff and what that aspect is, but she's done a good job for us two years in a row in camp and we'd like to have her help out throughout the year." Sowers spoke publicly about her sexuality for the first time in an interview with Outsports.com. She told Outsports that she came out to her family while at Goshen College, a small, Christian school in Indiana. She also said she lost an opportunity to be a volunteer coach because of her sexual orientation. "That moment really impacted me because it was the first time I truly felt judged because of my sexual orientation," Sowers said. "I was so passionate about coaching and to feel like my opportunities were limited because of who I loved was hard to deal with. However, without that experience, I would not be where I am today." While at Goshen College, Sowers played basketball and soccer and ran track. Her name is Liz, and she also plays football.